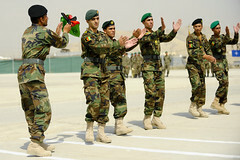 The NATO plan to withdraw from Afghanistan by 2014 will force U.S. and allied troops into overdrive as commanders struggle to prepare Afghan security forces for the task of protecting the country's elected government while reducing corruption and breaking the will of the Taliban insurgency. Given the enormity of the job, many experts say that NATO troops will be staying far beyond the announced date. Still, a 2014 drawdown of forces is much more feasible than the original timeline of President Obama, who announced in December that American troops would begin to withdraw by July 2011. Perhaps the biggest challenge facing American and NATO commanders is turning the Afghan National Army into a competent force capable of resisting the Taliban and loyal to the national government. The problem with dealing with illiterates is teaching them even basic things. Then there is the other problem with many of the Afghan troops, they are not very good, brave or loyal. There are some exceptions to this in their special forces, but overall the Afghan army want fight even with the US by its side sometimes. There is also the Karzai problem. If the Afghan army adopts his strategy for dealing with the Taliban, they might as well hand the keys to the government over to the illiterate religious bigots and let the head chopping begin. Isn't his wife in jail? Runaway jury in DeLay trial?